Whenever you plan a research trip, time is a very big factor – there never seems to be enough time to visit all the places of interest, and this is especially true in Chicago. When I was making my itinerary, I was trying to choose between the Chicago Public Library and the Chicago History Museum. I only had time for one. I am fortunate that I decided to follow someone’s suggestion and chose the Chicago History Museum because that happened to be the place where one of my mysteries was solved. Who led me to the Chicago History Museum? Some months ago, Jacqi Stevens , a fellow genealogy blogger, made a comment on my blog, asking if I knew about a locally-focused family history group called Chicago Genealogy. I didn’t. Jacqi said it was a Facebook group. Fortunately, I had opened a Facebook account some time ago for genealogy purposes. I requested admission to the group and began receiving members’ postings. As I came close to leaving on my trip to Chicago in September 2012, I asked the group for their suggestions on the best places to do research in the city. 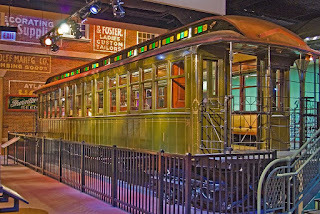 One of the members said that I should definitely not miss the Chicago History Museum. I am so grateful that I heeded this advice. After spending two days at the Newberry Library, (see Oct 31st post) I headed over to the Chicago History Museum. Somehow despite all my planning, I had forgotten the 1:00 opening time. I arrived at a few hours early, but that turned out to be a good thing because I was in time for a tour and lunch in the Museum cafeteria where you can eat a tasty meal in the sun room overlooking the Museum grounds. 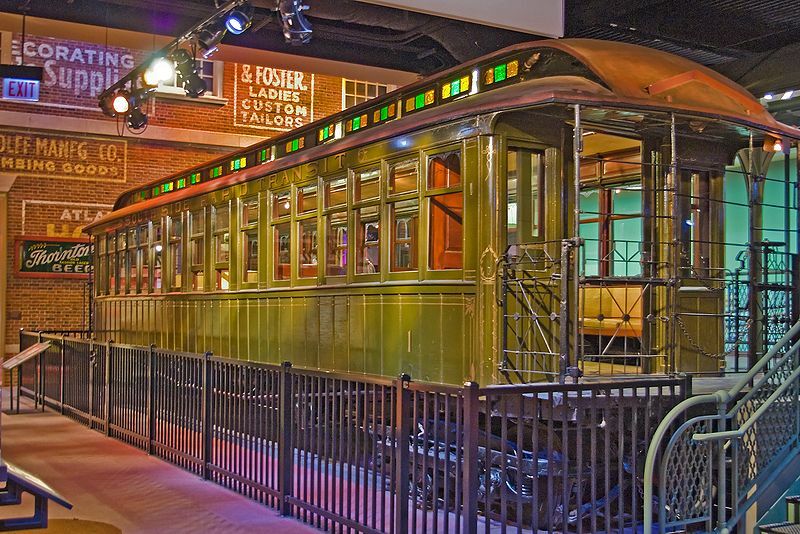 The tour takes place in The Exelon Wing, “Chicago: Crossroads of America.” This glimpse into nineteenth and twentieth century Chicago, including an authentic elevated railroad car, really puts you in the mood for some more exploration upstairs in the Research Center. At l:00 sharp I was waiting at the door. As you know from visiting different libraries and research facilities, each one has its own set of rules for protection of its precious documents, photographs and other historical memorabilia. At the Research Center, you are asked to lock your purse in a locker, to use only pencils for writing, and to wear white gloves when handling photographs. Two archivists/librarians were at the front desk to greet me and asked what I was looking for. I was interested in finding a Sanborn map of Chicago that might show three cottages that my great grandmother, Mary Kearney/Carney Kries Lauer owned. The addresses of these cottages were 125, 127, and 129 South Irving Avenue. I knew about these properties because they were listed in the divorce record of Mary Kearney/Carney Kries Lauer and Otto Lauer in 1925 in Chicago, Cook County. 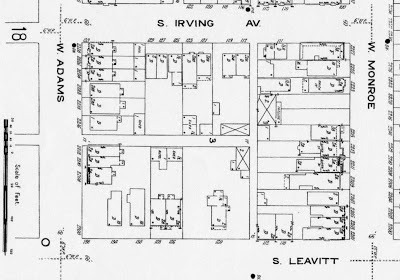 I had hired Kim Stankiewicz, a researcher at Genlighten, to look for land records on these South Irving cottages and to search for the property chain of ownership. Although Kim contacted several sources who might have had access to property records, none responded to her inquiries. 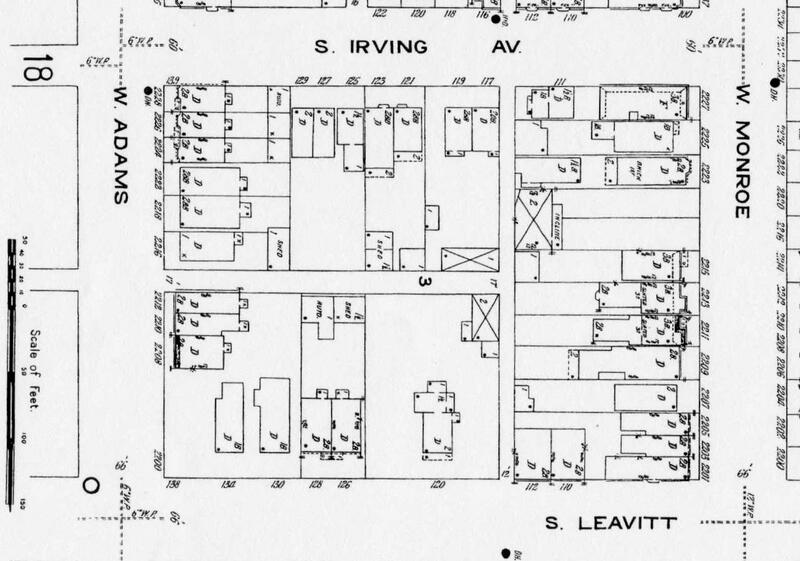 However, she consulted a criss-cross or reverse directory from 1928 which listed Mary Kearney/Carney Kries Lauer as the occupant and owner of 125 South Irving Avenue between Monroe Street and 118th Street. However, the librarian also produced a second Sanborn map from 1950 where the cottages had vanished. So now I knew that sometime between 1928 and 1950, the cottages were torn down. My visit to the Chicago History Museum was very profitable. In addition to the Sanborn maps that verified the location of my ancestral cottages, I also found a history of the Near West Side that gives an incredible look into how the inhabitants of that area lived. Look for more on this amazing historical study in a future post.